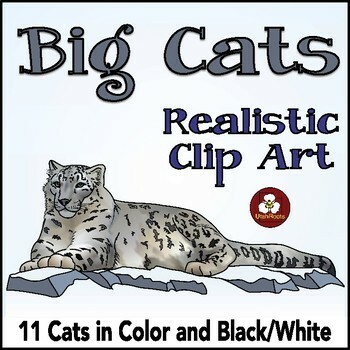 In this collection of high-resolution realistic clip art images you will receive both color and black/white images of these 11 big cats: a lion, lioness, leopard, jaguar, cougar (puma), snow leopard, cheetah, clouded leopard, bobcat, tiger, and lynx. 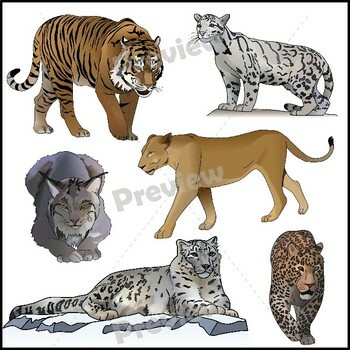 The clouded leopard and snow leopard are unique to this set and not found in any other set. 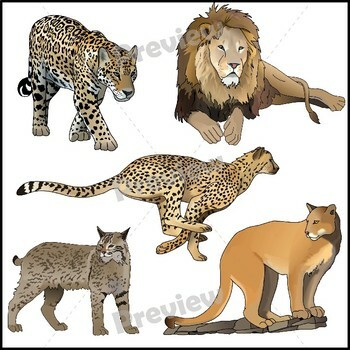 •	Please go to your My Purchases page (you may need to login). Beside each purchase you'll see a Provide Feedback button. Simply click it and you will be taken to a page where you can give a quick rating and leave a short comment for the product. I value your feedback. It helps me to make resources that meet your needs. •	Look for the green star near the top of any page within my store and click it to become a follower. You will then receive customized email updates about my new products.